The A7 Sportback has short front and rear overhangs and a muscular stance. Audi's latest A7 Sportback is the new "dynamic, sporty face" of the brand, design chief Mark Lichte said. Audi has given the second-generation luxury sedan a fresh, muscular exterior design, cleaner interior and advanced technology including remote garage parking and 48-volt mild hybrid technology that improves fuel economy. 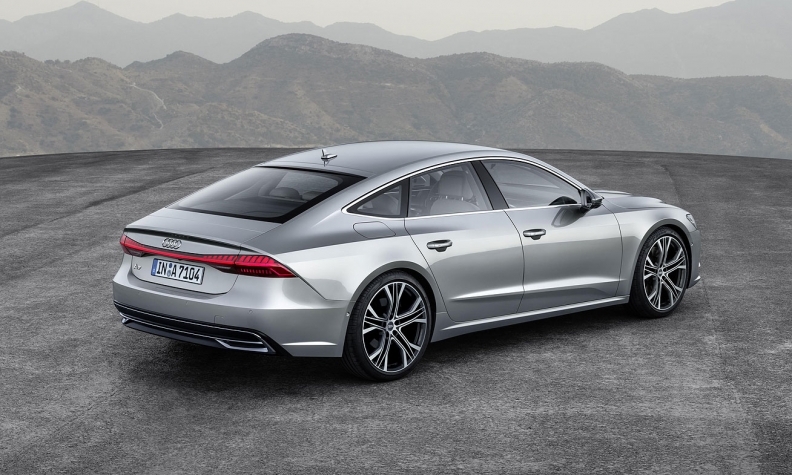 The new A7 takes its design cues from the Prologue concept unveiled by Audi at the 2014 Los Angeles auto show, Lichte said at the car's unveiling to journalists on Thursday. The A7's remote parking pilot and remote garage pilot will enable the car to maneuver itself into and out of a parking space or garage after the driver gets out and launches the program through a smartphone app. It will be made available next year, Audi said in a statement. The A7's interior has a reduced, clean design language, with an emphasis on horizontal lines and a sleek instrument panel "creating a feeling of airy spaciousness," Audi said. The 10.1-inch upper display controls the infotainment system while the 8.6-inch lower display provides access to the climate control system, comfort functions and text input. The four-door sedan has a shortened overall length compared with the current model but a longer wheelbase, which results in more rear kneeroom and headroom. The A7 will initially launch with a 340-hp 3.0-liter V-6 gasoline engine paired with a seven-speed S tronic dual-clutch transmission. Additional six- and four-cylinder gasoline and diesel engines will follow shortly after the start of production, Audi said. The A7 will launch in Europe early next year with prices starting at 67,800 euros in Germany. The car will arrive at U.S. dealerships in mid-2018.